"Lamentation Poem for the Crocodiles of Lago Enriquillo"
Wood, shell, sand, charcoal, crocodile cranium bone, 13"x14"
My work as an artist focuses on wilderness and water issues. I have explored water metaphorically, symbolically and literally using an interdisciplinary, multimedia approach. I move back and forth between sculpture, photography, poetry, writing, and performance depending upon what I want to express. I have worked internationally with water issues in Canada, the United States, Europe, Morocco, the Caribbean and Indonesia. While Artist-in-Residence in the Dominican Republic, I did an installation, Lamentation Poem for the Crocodiles of Lago Enriquillo, about a lake near the Haitian border where crocodiles have been decimated by hunters. Poem for Yemanja was created after researching the Afro-Brazilian deity of the ocean along the coast of Brazil. Collecting waters from around the world for this piece has led to a novel-in-progress about an International Library of Waters. Out of a Fulbright Senior Research Grant to Southeast Asia and sabbatical spent in Java and Bali a series of wet poems are evolving. Large, room-size light installations, particularly Sanctuary and Desert Tides, create serene space for the viewer to enter and wander through. Also since 1995, I have been facilitating A Gathering of Waters, a bi-national grassroots, community-based effort to focus awareness on the Rio Grande/Rio Bravo and to physically carry water from the source in Southern Colorado to the Gulf of Mexico, symbolically restoring one of the river's natural functions - completing its course to the sea - a task it can no longer accomplish due to control and consumption. The project emphasizes the rich diversity of the upper and lower river basins. Three other aspects of my water imagery include the use of suspended boat forms, of salt as a material, and of archeoastronomy drawings (depicting the moon's pull on the tides) superimposed over our bodies. For thirty years I have explored the realm of the Artist's Book. 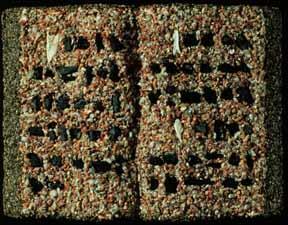 Upon moving to New Mexico in 1985, I began an ongoing Wilderness Series which are carved wooden books covered with earth. The "words" on the open pages are natural objects from the site that speak not in Swahili, Spanish or Tewa, but in an international ecological language. I aspire to more reverence, respect for the extraordinary in the everyday, awe and wonder about the world around us. All images and text © Basia Irland.